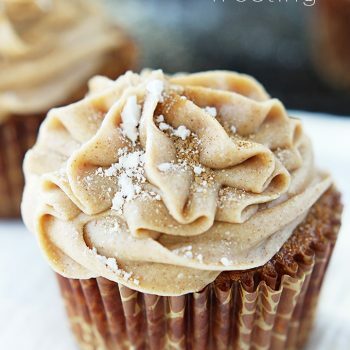 Fluffy gingerbread cupcakes with the BEST rich cinnamon cream cheese frosting! Preheat oven to 350 and line muffin tins with cupcake liners. Whisk together flour, ginger, cinnamon, nutmeg, and cloves. Set aside. In a another, large bowl cream together butter and sugars until pale and fluffy. Add molasses, beat until combined. Add eggs, beating after each until incorporated. Beat in vanilla. Gradually mix in flour mixture until combined. Divide batter evenly among the lined cups, filling each 3/4 full. Bake about 25 minutes until an inserted toothpick comes out clean. Allow to cool in the muffin tins for about 10 minutes, then transfer to wire racks to cool completely. When cupcakes are completely cooled, prepare the frosting. Beat the cream cheese until fluffy (about 2 minutes). Add vanilla, cinnamon, and 2 tablespoons of heavy cream and mix until smooth. Gradually mix in powdered sugar. Add 1-2 more tablespoons of heavy cream as needed to thin the frosting to a spreadable consistency. Spread on cooled cupcakes. (see note) Store in airtight container. **For the frosting, the above recipe is for enough frosting to spread on each of the cupcakes. If you want to pipe the frosting, double the recipe and when adding the heavy cream, add less than you would to spread the frosting. The shape holds up better when the frosting is thicker. Also, before piping the frosting, it may help to allow the frosting to set up for a few minutes and "dry out" a bit. This will help it hold it's piped shape.